When news came of Primo Levi’s sudden death at the age of sixty-seven, there were many people who refused to accept that he might have killed himself. Levi had slipped, they said, and fallen over precarious banisters; he was ill; the hall was dark. T here was even some talk of murder. And when the evidence that it was suicide became irrefutable, they were quick to say that it was then obvious that Auschwitz had got him in the end, as if evil of such an order gave his death reason. The more unforgiving were angry, like a writer in the New Yorker, who suggested that Levi had cheated his readers with a last and terrible act of denial. In Italy, fellow survivors accused him of unforgivable selfishness. Levi’s death in fact caused such a stir that it has become one of the dates in the literary history of the twentieth century, rather as people remember the day that Hemingway shot himself in Ketchum in 1961. 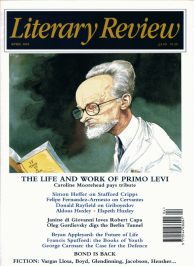 It is not surprising, then, that two new biographers devote many pages to the end of Levi’s life: Carole Angier, almost a third of The Double Bond; Ian Thomson, not much less of Primo Levi.